Today I am part of the Grimm Chronicles Vol. 2 tour. There is a giveaway! Be sure to check out the rest of the tour stops. The second volume of the story is just as good as the first one. We see the comeback of the main characters and we get to meet new ones. Just as funny and entertaining, easy to like or hate and relate to them. We get new stories, most of them I didn't recognize and even bonus material. Again, as I said last time, even if you don't know every story written by the Grimm brothers, you get all the information needed to understand throughout the book. Things just get more exciting and weirder, it's filled with magic and valuable principles. There are a lot of ideas in this book that come from values we should have as humans. We get to see in a magical way how they affect us in real life. "I know it sounds selfish to think about, but I couldn't stop thinking why me?" I'm sure most of us have considered this at some point. The plot, even though it's surrounded by magic and fairy tales, is realistic in its way. The main character is only human (as far as we know) and it's not easy to fight magical beings in a world where they shouldn't exist. Dealing with common issues as high school, bullies, mean girls and popularity along the way. How can a book have everything and not sound a little crazy? This book has very different ideas mixed together making it an interesting story. We get to meet new characters from the 1860s, based on our world so it has a little of historical fiction. I'm not a fan of historical fiction but this makes interesting. Common US history in a new, interesting way. This story has been very entertaining, sometimes funny and I just can't wait to see how it'll all end. 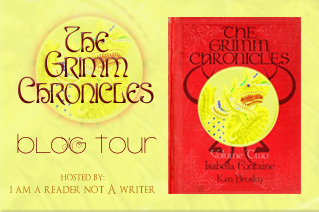 This is the last blog tour, Volume 2, for the Grimm Chronicles so far. I haven't heard anything about the last Volume; what new things we'll find out and how the characters deal with all of it. It was fun, there were 6 books with different stories and I think the authors have done an awesome job with this retelling of popular fairy tales mixed with crime set in our real world. "Let me get you caught up quick. I'm the hero. I have a magic pen, blah blah blah blah." I loved this quote! "I have no idea how Genetics works, like, at all..." (This has to do with a class she's taking) I took one class about three years ago because I've always liked Genetics and I found out this that first day too. I had to read books just to catch up with the others. It wasn't my major so it was all new to me. "Knowledge is power." Again, the same principle in the story. "Then I realized what I'd just done. And nearly fainted right there in my little pile of wide-lobed oak leaves." I love this new character. "Violence corrupts the soul. Blinds the eyes. Makes a man into something less." "Showing compassion for another human being is never a mistake, sir. It's what separates people like me from people like you, and I don't ever want to become someone like you." "There are enough human beings harming each other in this world. And where does it get them? Nowhere. Ever." "Hope can give us strength even when we're surrounded by dark water." Sounds interesting!! love the context.. my niece loved the books the Sisters Grimm. It got her to reading again.. This sounds so fantastical. I'd have to be in the right mood. I just read on the YA Blogsphere that you love mysteries. I'm new to that genre, but I love Sue Grafton and Craig Johnson. That's all I got so far. I think mysteries is what I read most before I found YA paranormal, dystopians! Oh wow. There are more than this one. Hmmm, I need to see about getting the other as well. :) Thank you! Each Volume has three books, there are 6 books so far. You should read them!